B. Murphy; G. O'Brien, Maguire, Price, Flynn; D. O'Connor; Baker, A. Murphy (Amond, 62 mins. ), Rice (Doyle, 90+1 mins. ), S. O'Connor (McGill, 76 mins. ); Purcell. Barry Ryan; Lynch, Brennan, Paisley, Frost (Kirby, 7 mins. ); Guy, Fahey, Dempsey, Byrne; O'Neill (Fitzpatrick, 90 mins. ), Quigley. Damien Lynch played the captain's role as his first half strike earned St Pat's their second big Dublin derby win of the season to put them four points clear at the top of the Premier Division table. The result was harsh on Rovers, without a win now in four games, as they finished with ten men. Rovers had a poor record against St Pat's last year, losing their last meeting 5-0. But they started well and might have been in front after just two minutes. Darragh Maguire, who joined Rovers from St Patrick's in the close season, won a header from Ger O'Brien's long free-kick to set-up Tadhg Purcell who brought a save out of Barry Ryan with the loose ball being hacked clear. Still missing the injured Joe O'Cearuill and David Partridge, and forced into an early change at left-back, St Pat's were unsure in defence and survived a dreadful miss on 14 minutes. Stephen Rice's cross picked out the run of left winger Sean O'Connor who shot shamefully over the bar from close range. 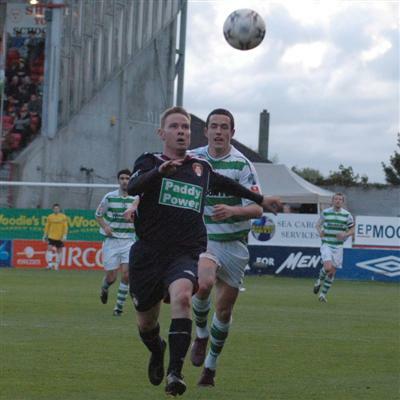 It was a miss Rovers would rue as they gifted St Patrick's their matchwinning goal on 26 minutes. Goalkeeper Barry Murphy, back in the side following a minor groin operation, uncharacteristically failed to catch Stephen Brennan's lofted ball into his area under pressure from Lynch who reacted quickest to shoot home the loose ball. Ryan maintained St Pat's lead when producing a sublime save at the other end four minutes before the break when pushing away Maguire's header from Alan Murphy's corner. The second half was a disappointment on the first 45 minutes. With Keith Fahey starting to play, St Patrick's took a grip on midfield as Rovers struggled to maintain their tempo of the first half. Danny O'Connor shot wide after good work from Baker and O'Brien on 72 minutes, the closest Rovers came to equalising. Referee Alan Kelly, whom Rovers had been unhappy with for much of the game, then sent off Danny O'Connor on 85 minutes for a challenge on Guy, his second booking.